Even some animals simply refuse to be stereotyped. Seals for one are widely regarded as gentle beings, friendly and peaceful. They are more often than not the victims of attacks, rather than the aggressors. One seal proved the contrary. New Zealander Kyle Mulender has shared a video on Wednesday that has since gone viral. 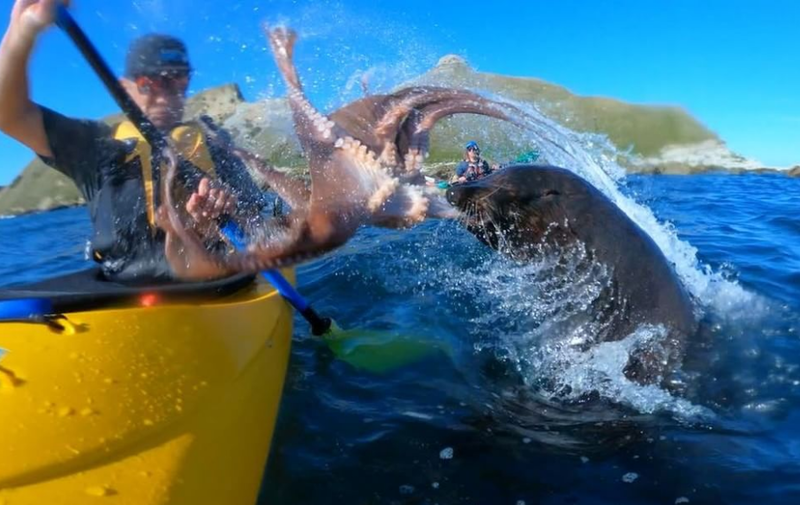 He is shown in the footage kayaking with friends near Kalikouta town off the east coast of the South Island. Then he witnessed something strange and even amazing. Good thing the spectacle was captured on camera. That is - until things got a bit out of hand and they were affected by the animal fight. Mulender added that they were shocked when all of a sudden, the seal just popped right out of the water, and its adversary, the floppy octopus, ended up slapping him in his face. That’s when he knew his “fate was sealed”, so to speak. Mulender and his friend, Taiyo Masuda who captured the octopus’ seal of approval via his GoPro Hero 7 camera, ended up laughing about the whole scenario for the rest of their trip. And as soon as people on social media saw their video, too, they also shared in on the fun by coming out with their own captions, jokes, memes and opinions about the antics of the fighting animals.